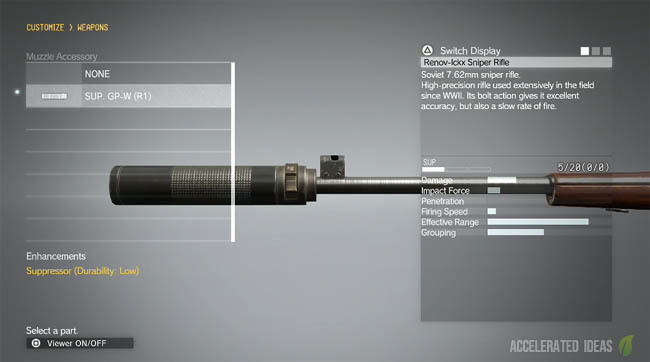 One of the hidden and surely best unlocks in The Phantom Pain is the Legendary Gunsmith which allows players to customize their existing weapons and cheat their way through R&D. This Gunsmith is unlocked through a series of fairly simple Side Ops in both Afghanistan and Africa. I know, I know...I did say easy Side Ops. That's not entirely true because the bloody things won't appear in the Side Ops list when you most want them. However, I've got another post to help you get past that difficulty. For now, let's concentrate on why the Gunsmith is so awesome. Successfully completing Side Op 107, 108 and 109 will unlock a new menu option from the iDroid. You may have seen the Customize option previously when changing the loadout for D-Walker? Well, this same menu gets a new customization option called Weapons. In a way yes. 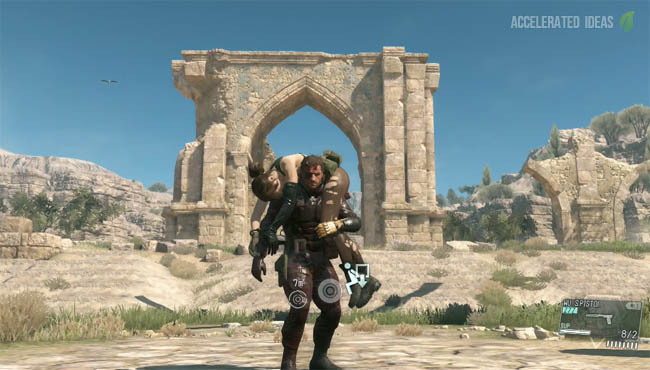 The Customize Weapons screen allows you to mold several weapon parts together to create your perfect weapon. The only rule is that you must have at least unlocked that weapon part previously. So for example, if I wanted to create a silent non-lethal sniper rifle then I'd need the base non-lethal sniper and I must have unlocked at least one weapon with a suppressor in the R&D screen. 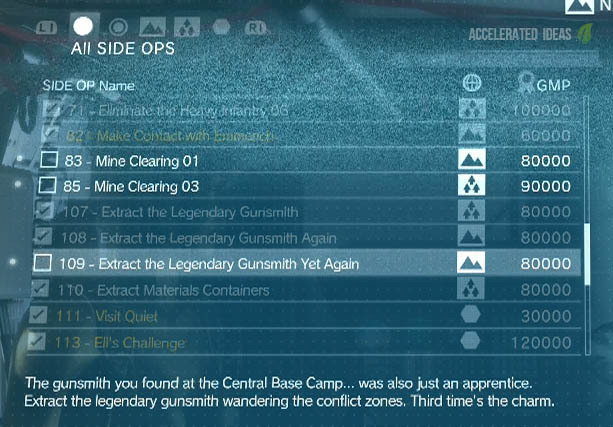 I did exactly that as soon as the Gunsmith was unlocked. I took the ok-ish bolt action non-lethal sniper rifle (Renov ICKX TP) and melded on a suppressor to make this weapon 10 x more awesome. Now enemies couldn't hear my shots fired and a mini-alert wouldn't trigger as often as I infiltrated bases. Once you complete a customization simply select OK to save the design, which is then added to your inventory. 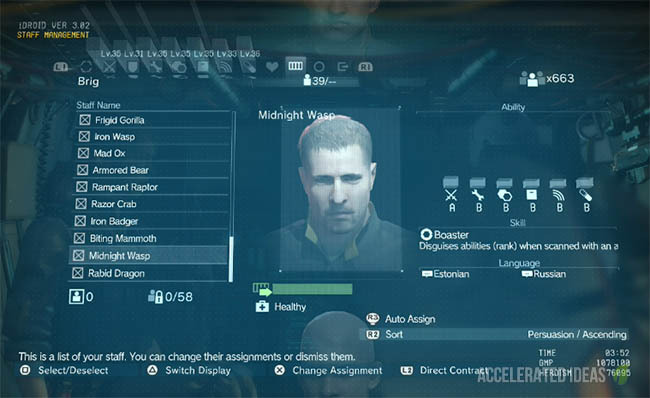 The next time you start a mission the customised weapon will appear as an option. 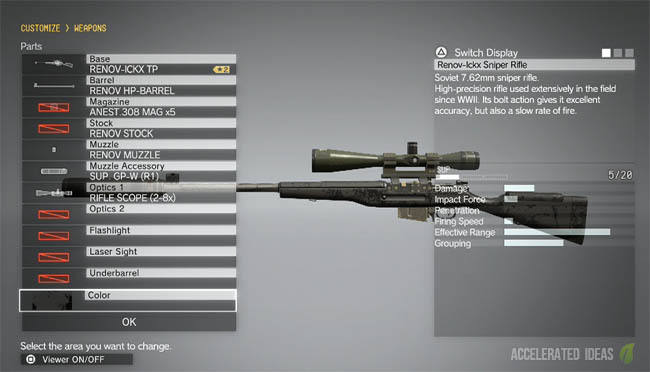 See the screenshot below which shows my customized sniper rifle. Notice the little yellow star to distinguish it from the original weapon. You can also deduce from this that the customized weapon doesn't replace the original; it simply creates a carbon copy for you to base your customization upon. There's the chance to customize up to three weapons of the same type e.g. assault rifle, which I think is a generous number really.